Easily mistaken for a vicious brand of shampoo and very often catapulted into turmoil by wars and magical beasts, the fictional kingdom of Ivalice has been the setting for a handful of Square Enix titles, almost all of them well-received by critics and fans alike. Just recently, Final Fantasy XII followed the adventures of some free-spirited (and pointy-eared, in one case) residents of Ivalice. It follows then that Square Enix has announced an "Ivalice Alliance," a set of stories all taking place on the same stage. 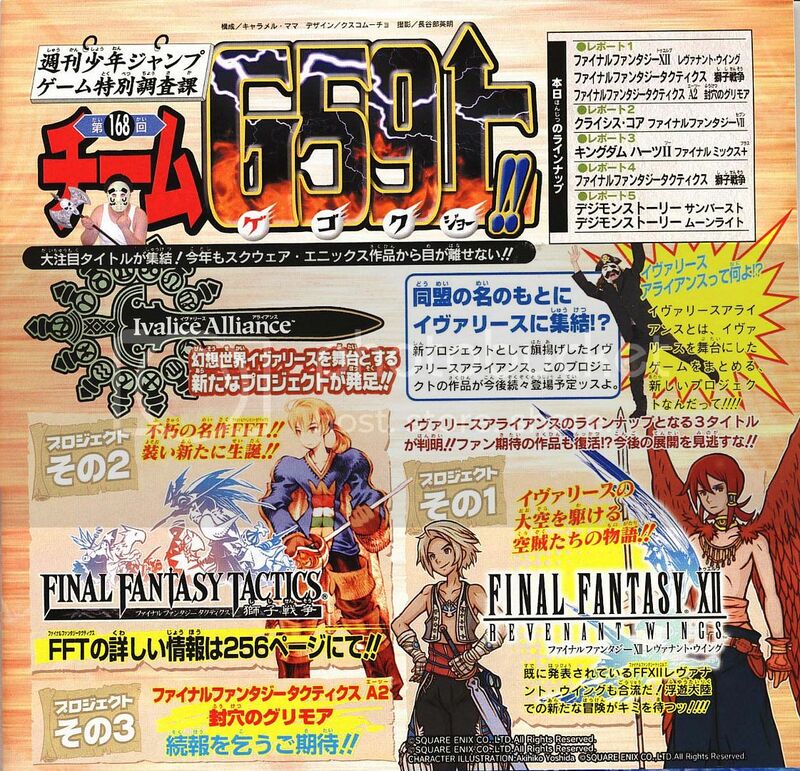 Though you're already familiar with Final Fantasy XII: Revenant Wings (slated for the DS), you may not have heard of the other two games revealed in the latest issue of Japan's Shonen Jump. The pages first mention Final Fantasy Tactics: The Lion War, a PSP remake of the original PSOne Tactics game. Some new cutscenes and a slight graphical upgrade are likely to be included, though we certainly wouldn't mind a better localization as well -- that's assuming the game makes it stateside. Secondly, there's (deep breath) Final Fantasy Tactics A2: The Sealed Black Book. According to the translation note on Jeux France, it hasn't yet been specified whether it'll wind up on the DS or, as the horrific machine translation puts it, the "Game Servant Boy Advance." The latter choice, of course, will result in the game working on both platforms. Snap to it, servant boy! 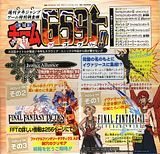 Another magazine, Gamelabo, reportedly mentions that Square Enix also has two more unannounced Xbox 360 games in the pipeline. 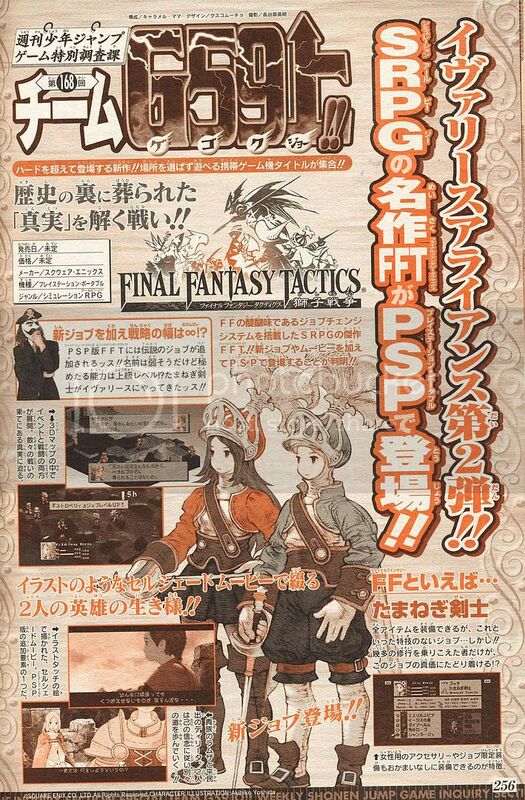 The PSP will be getting Final Fantasy Tactics: Shishi Sensou, an updated version of the original PlayStation classic. Square Enix is adding new jobs and some slick cell shaded movies, but aside from that, it's unclear what kind of improvements we can expect. The second project is a bit more mysterious. Nothing is known about this game, except for its title: Final Fantasy Tactics A2 Fuuketsu no Guurimore. We don't even know its target platform. Jump is promising an update down the road. Най-вероятно ще е FFTA продължение за GBA. А2 като нищо е за Адванс 2. Портът на Валкирията, Пауър Стоун Кълекшъна и Тактикса (оригиналния)ше ме принудят да взимам ПСП. БТВ, новият джоб на скрийна ми мяза на някакъв по-особен Кемист. Най-любопитното за мен в инфото (ако е истина) е солидният съпорт за 360.
king_of_the_universe написа: А2 като нищо е за Адванс 2. Портът на Валкирията, Пауър Стоун Кълекшъна и Тактикса (оригиналния)ше ме принудят да взимам ПСП. Аз съм по ролевките и тупалките, екшъните са ми по-назад в графика. Едната от новите професии прилича на Fencer от FFTA, другата е нещо магическо. Графиката не е пипана, виждам добавени кът-сцени. Дано са добавили и още странични куестове, че в оригинала не бяха особено много. Добре ще е да са оставили възможността да изникват битки и на преминати вече терени.